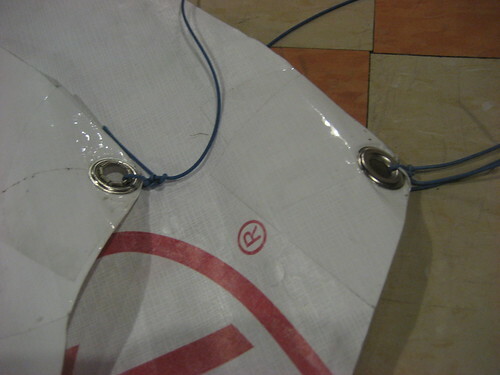 I've built a series of three Fled Kites out of Tyvek housewrap and bamboo. The most recent I built to the full Fled scale, 209cm across, and it rocks. I've been able to lift a kite in a steady breeze measured at 3-5mph on the ground, and as long as the wind on the ground doesn't drop much below 5mph (I can't quite tell, as my anemometer doesn't go any lower than 4), it will stay in the air lifting a cannon Elph SD600 (250g). I've flown it in gusts up to 15mph on the ground and it just sits steadily in a constant point in the sky. My previous 160cm Fled was destroyed in winds measuring 25-35mph at ground level. Gusts would occasionally cause it to do loops, which I think was owing to its lightweight 1/2 pole of thin, 1cm bamboo for the bow (more in construction notes). 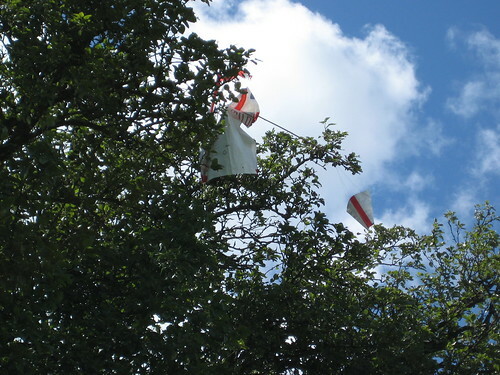 The bow eventually broke through the spar pocket and the kite spiralled into a tree, where it probably still is. Wing load is the weight of a kite distributed over its area, expressed in grams per square meter. my 209cm Tyvek Fled is 2.2 square meters and 790g, giving it a wing load of 359g/sq m, or 473g/ sq m with a camera attached. 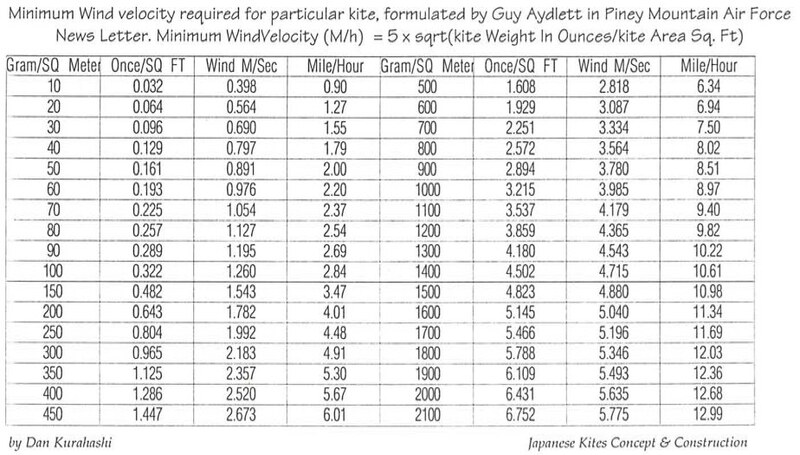 According to this chart from Dan Kurahashi's Japanese Kites and Construction, My kite shouldn't be able to fly in anything less than 5.4mph, and lift a camera in less than 6. The ~1mph difference between these figures and my field experience can be accounted by the fact that wind speed is higher off the ground, and speaks volumes for the Fled kite design, as it is performing very close to or at its theoretical minimum. 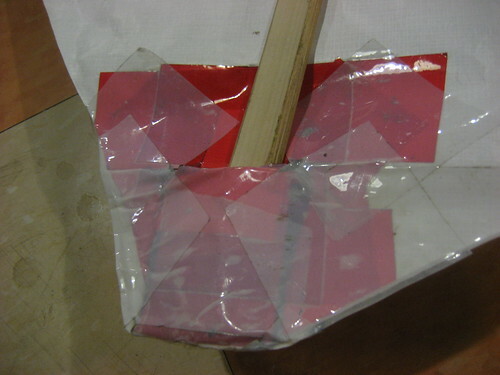 To build this kite you'll need a 5cm thick culm of bamboo at least 209cm long and cured, tyvek housewrap, 5/32" eyelets, 5/8" grommets, and a roll of 2" tyvek tape. Incremental cost of Materials: ~$6. I have $10 worth of grommets, $12 worth of tape, and $100 roll of 9' x 100' tyvek, but my previous two kites were made from construction scraps. This Fled follows Brooks Leffler's dimensions exactly, just with tape, Tyvek, and bamboo. The drogue tail is built slightly differently. Instructions in the attached PDF below. Patterning and building this kite took 3 hours, including splitting bamboo, with the assistance of both Louise Larson and Olivia Everett. 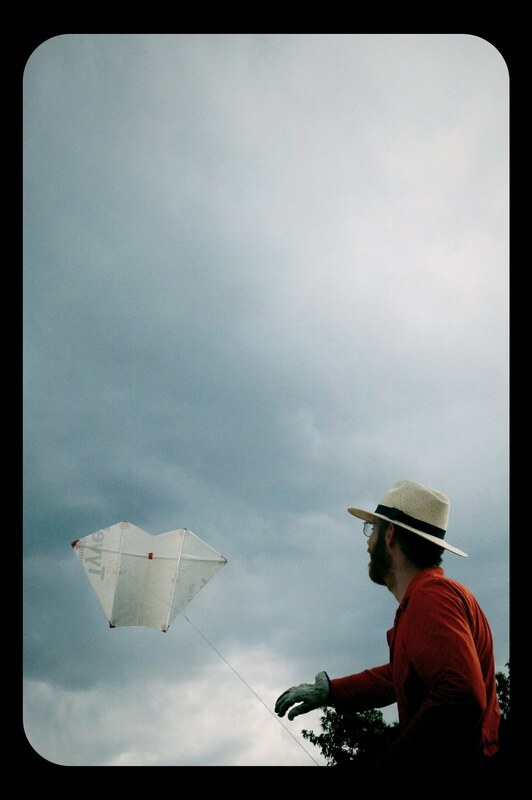 With a full-size pattern in hand, I expect that the kite could be constructed in 1.5 hours. 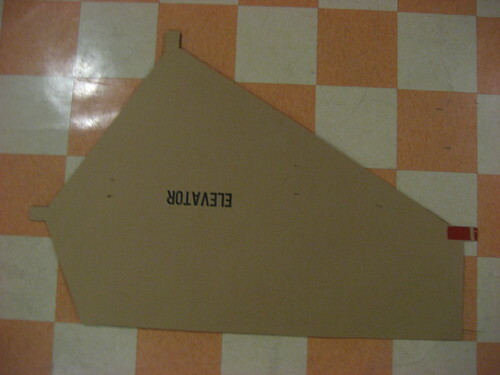 I made a measured the pattern out on a single piece of cardboard with all spar pockets included, to simplify construction and strengthen the pockets. The twin keels are attached to the line by 3/8" grommets, and the Drogue tail attachments are held in place with 3/32" eyelets. Both were applied to tyvek with a layer of tape on both sides. Without the tape they'll tear through. Bamboo Bamboo from a 5-6cm culm donated to me by was split down to 2cm thick pieces for the vertical spars and 2.5cm for the bow. All the bamboo spars are wrapped in tape at the ends to make them less sharp and less likely to tear the kite. See my note on splitting bamboo for more. These pieces weigh 620g, and are definitely the place where weight could be saved. They are stiff and do not visibly deform in flight. They are probably over-built because I was worried about under-building like my previous Fled. Spar Pockets All the spar pockets are re-enforced with an insert of extra Tyvek to re-enforce them, and are taped with an X-shaped tape re-enforcement pattern at the corners. They have proved to be durable through handling and crashes, so long as they aren't abraded on pavement.